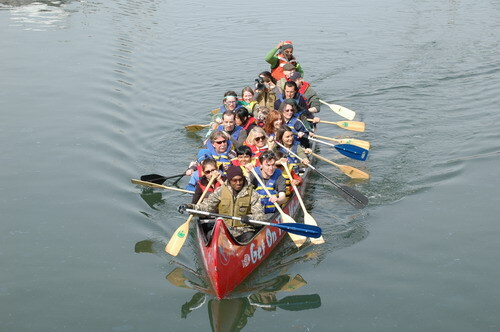 If you happened to cross the Gowanus Canal at some point on Saturday afternoon and saw something a little weird--like a 32-foot long canoe with about 20 people in it rowing up the Big G--you were witnessing the Water Rising Flotilla. 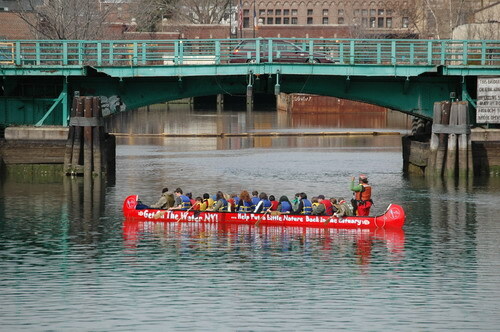 (We understand that it turns out there is irony here, as the Gowanus waters did in fact rise significantly on Sunday and that the canoe could have been used on the streets in some places.) The Urban Divers hosted tours up and down the Gowanus aboard the vessel, which made its way through especially grungy water at low tide. Our favorite paddlers though, were the two brave souls pictured in the kayak at the bottom. 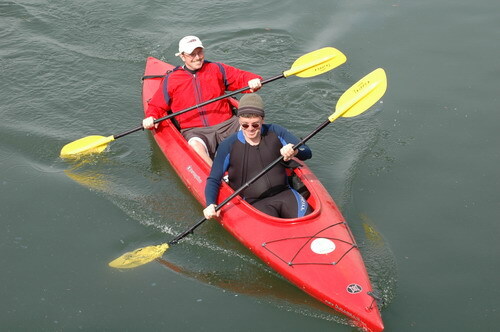 We love kayaks but we would never dream of going out on the Gowanus in one. We salute the two kayakers that we saw, and had them in our prayers all day. For those of you that dig the live action, we've got video too.